One of his graduates is a lead propulsion engineer for Virgin Gallactic, working to help the company make space travel and tourism a reality. Others work at the Air Force Research Laboratory and General Electric’s jet engine division. 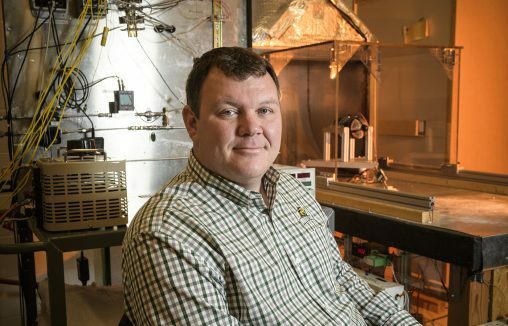 Rory Roberts, associate professor of mechanical and materials engineering at Wright State University’s College of Engineering and Computer Science, is a power guy. And students who go through his senior design class get state-of-the-art lessons in propulsion, hands-on experience and interaction with industry and military engineers that put the graduating students on the inside track as they start their careers. “They’re getting really good jobs,” said Roberts. A native of Arkansas, Roberts earned his bachelor’s degree in mechanical engineering and physics from Arkansas Tech University, his master’s in mechanical engineering from what is now Missouri University of Science and Technology and his Ph.D. at the University of California, Irvine. He worked for Rolls-Royce on gas turbine engines and fuel cell development before joining the faculty at Wright State in 2009. Students in Roberts’ senior design class must complete a design project and master skills in management, teamwork, communication and proposal-writing along the way. 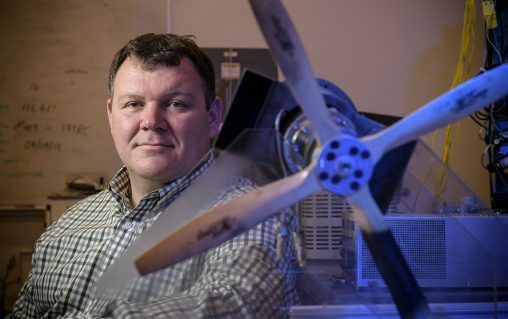 In some of the projects, students have used a small gas turbine engine provided by the Air Force Research Laboratory as part of the Aerospace Propulsion Outreach Program to attract more engineers to the field. Gas turbines have blades that spin at high speed and compress the air, which is sprayed with fuel and ignited. The burning gases expand through a turbine and blast out through the nozzle at the back of the engine, creating thrust. In one project, students built a turbine engine with a propeller — a turboprop. The project later evolved to hooking up the engine to a solid-oxide fuel cell, a concept for advanced hybrid electric propulsion for the next generation aircraft. The cells produce electricity directly from oxidizing a fuel. Benefits include high efficiency, long-term stability, fuel flexibility and low emissions. “The students hit certain targets each year and future projects build on the previous work,” said Roberts. Rory Roberts said the hands-on experience his students receive in his courses provides invaluable real-world lessons. Other projects include electrical power production for hypersonic vehicles that could also extend the range of unmanned aerial vehicles. Roberts said the hands-on experience provides invaluable real-world lessons for the students. The students benefit from Roberts’ connections to the Air Force and industry. And students are being taught to look at the entire design process in aerospace propulsion and understand how each of the systems interacts with each other. Roberts believes that his students are a year or two ahead of other graduates as they head off to their careers. “They are ahead in the sense that they are directly addressing needs that the industry has today and hopefully the needs of tomorrow,” he said.